People who followed the original Indie Uprising, and the small but noble group of people who actually give a crap about Xbox Live Indie Games, will recognize MagicalTimeBean as the makers of the excellent Soul Caster series. Recently they contacted us about their most recent project, a puzzle platformer called Escape Goat. The name alone was enough to motivate me to seek out a review copy. Now let us see if it can live up to the promise of the awesome name. Things can get pretty intense, even with simple graphics. 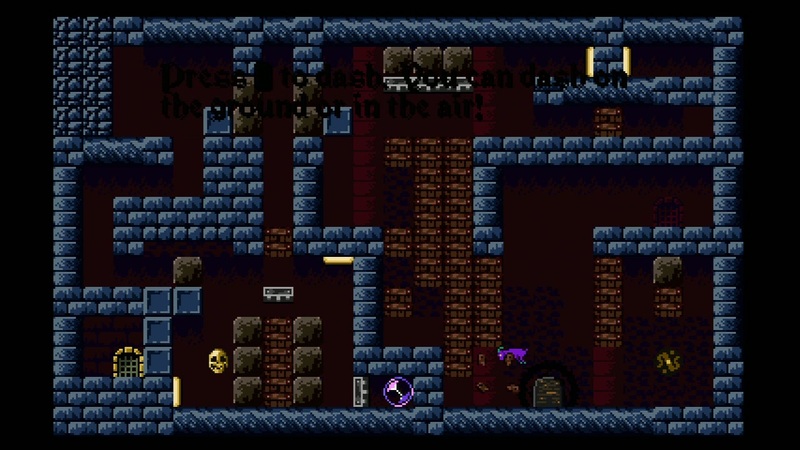 Like the Soul Caster games, Escape Goat goes with a low resolution, retro look. Those of us who entered the video game world in the days of pixels and sprites will appreciate graphics that hit you squarely on the nostalgia gland. 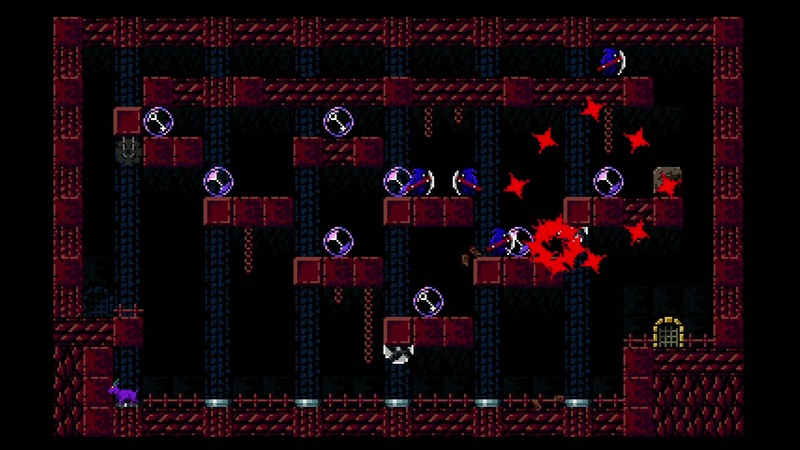 It has everything a player came to expect and embrace in those days; small but well-crafted characters, unusual and unique color palettes, limited but appropriate animations. 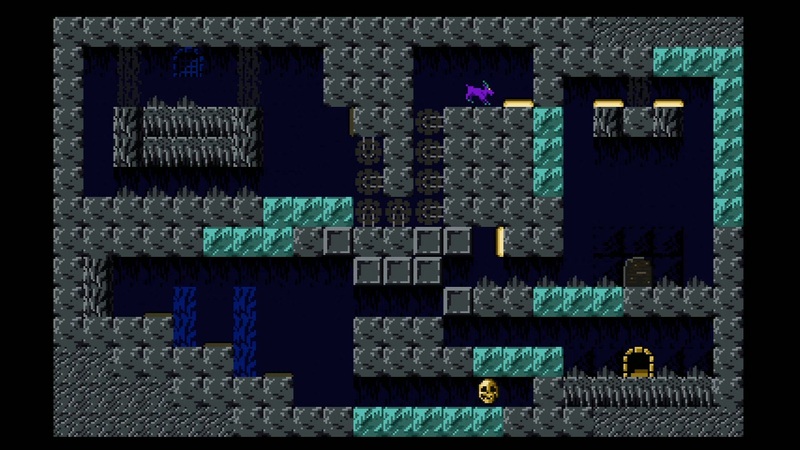 In this case you play as a purple goat who is teamed up with a yellow and red mouse, and you play thorough a variety of dungeon environments. The visuals may seem simple, but they are perfectly adequate, and there are even little touches included that put me in mind of the greats of the NES era. 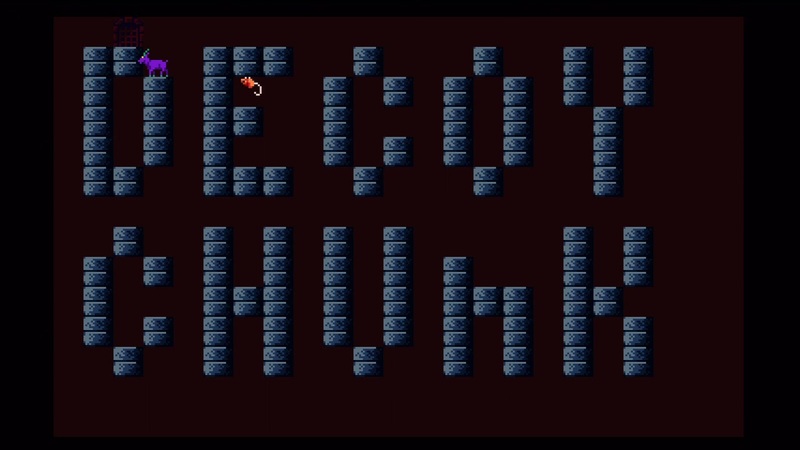 You know how Megaman used to nudge slowly forward if you just tapped a direction, and would bend down when you reached the top of the ladder? Well, our “goat on the lamb” (See what I did there?) huddles up when he gets close to the edge of a platform, and picking up a magic hat actually places it on the head of your mousy accomplice. 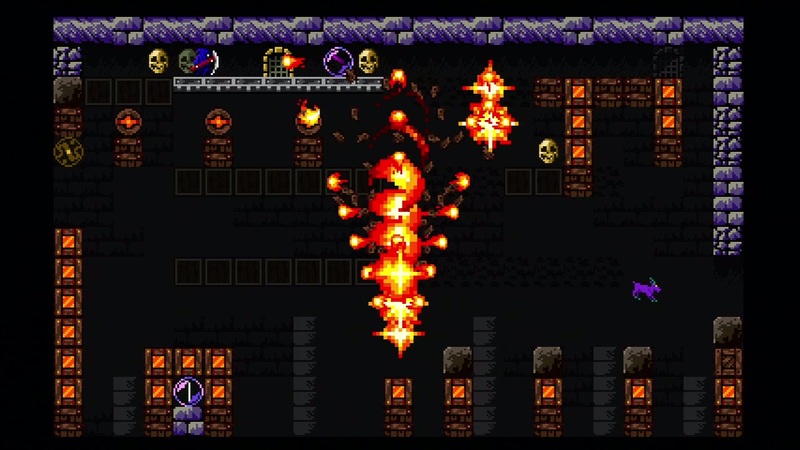 There is more than enough variety to the elements of the environment to let you know how they will behave and what state they are in, from breakaway bone-bricks to skull switches, and even rolling bombs. Seeing a huge assortment of these things reconfigure themselves, making the whole screen move and shift, is highly effective. Could they have done higher quality graphics? Yes, but I’m not certain they would have made the game any better. If anything, they may have stripped it of its charm. Some prophets have more interesting things to say than others. 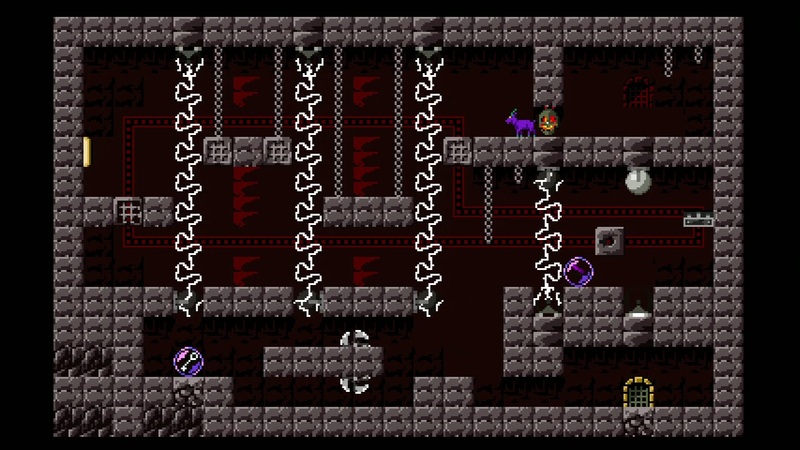 As should be the case with all quality puzzle platformers, the gameplay of Escape Goat is a handful of very simple concepts that come together in maddeningly complex ways. On the platform side of the equation is our goat. He can run, jump, double-jump, dash, and air dash. The since he can jump twice and dash once before landing, the fleet-footed little beast actually has a pretty high degree of aerial control. The dash, aside from helping you dart a short distance horizontally, regardless of what the ground might be like beneath you, allows you to break certain bricks and set others in motion. Joining you in this bizarre jailbreak is a mouse. Pressing B will drop the mouse on the ground, where it will crawl forward along floor, ceiling, and walls until it reaches ice, hits floor moving too quickly to cross, or gets killed. You also have the option of tossing the mouse into the air, potentially to stick to the ceiling and move on from there, or else lay it on the ground and tell it to stay put, where it can hold a switch down until you recall it. Aside from being able to squeeze through tight spaces or remain out of reach of hazards, the mouse will press any switches it comes across, and can be a useful decoy as well. If you find a magic hat on the level, you can even swap places with the mouse, rocketing through and destroying anything between the two of you in the process. This game taught me that magic hats make mice sleepy. The puzzle aspect comes in the traditional form. 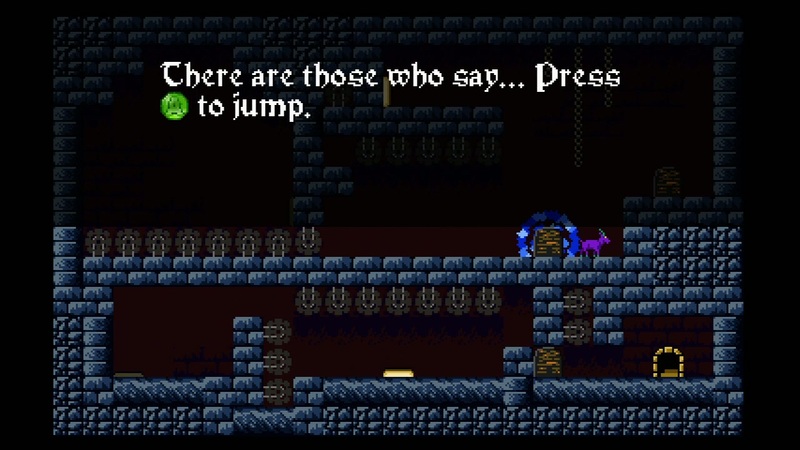 You are presented with a single screen level, and you need to reach the exit. 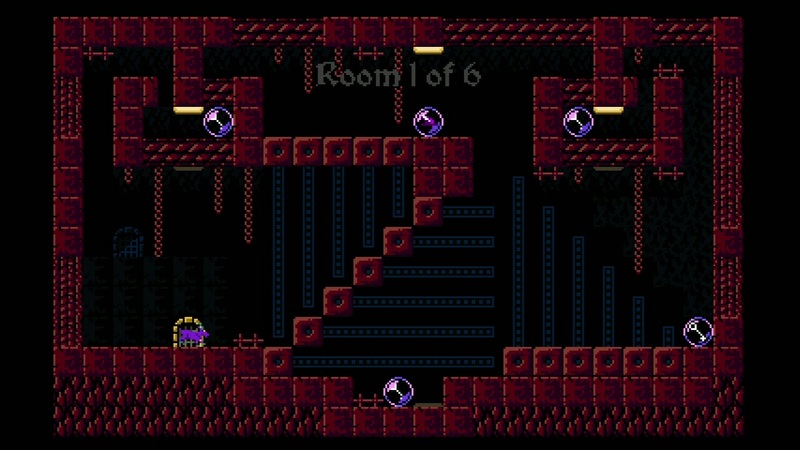 The door is often blocked, requiring you to hit the appropriate switch, or else it is locked, requiring you to collect all of the floating keys on the level before moving on. The elements that make up these levels are incredibly varied, and their interactions can get downright complex. There are exploding blocks, rolling bombs that burn before exploding, ice blocks, blocks that you can stack things on AND pass through, and many more. Similarly, there are a few different hazards that you need to worry about, including stone faces and grim reapers, each able to launch fire at you, saw blades that are like faster and more hostile versions of your mouse associate, and of course the constant fear of being crushed. 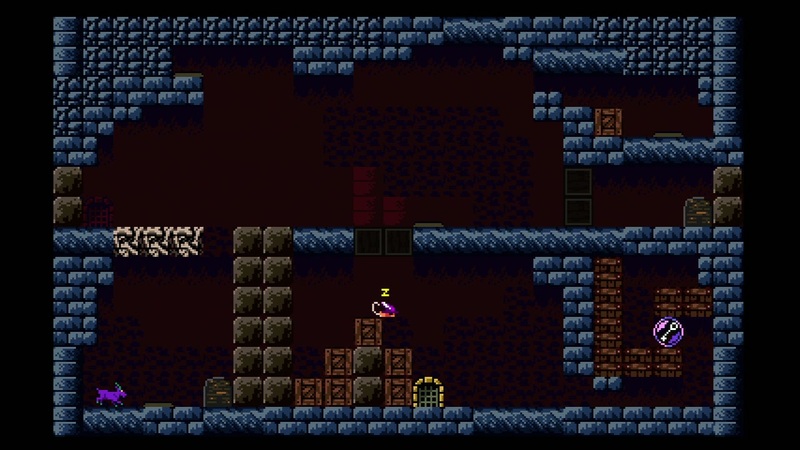 Pressing switches can shift whole chunks of the level around, potentially opening a path, perhaps causing a collapse of blocks that will make the level unsolvable. In a move that might frustrate some, but is really par for the course for a puzzle game, there is little to no indication of what a given switch will do, which frequently leads to a bit of trial and error gameplay. Fortunately, even the most complex levels are fairly short, so you seldom will find yourself wasting too much time banging your head against a wall. The first and most important test of any level editor. As a matter of fact, not spending enough time banging your head against the wall is potentially the games only real flaw. It is extremely short. The puzzles are suitably challenging, particularly toward the end, but with just six levels with six rooms each (one of which only contains a sleeping sheep which requires rescue), plus a final level with ten rooms, I had the game beat in 2 hours. On the plus side, there are two things that, if combined, would extend the play time significantly for the right kind of person. The first is a sort of a “new game+”, permitting you to play through the game again with the magic hat permanently applied. The other is a level creator, which technically would give the game unlimited playability. The sound is a match for the visuals, old fashioned 80’s synthesized music with the bizarrely technological sound effects you came to expect from games of the time. I would say that the audio is actually a bit deeper and higher quality than the games of old would have been able to pull off, but that certainly isn’t a bad thing. I know that if I was trying to keep a goat from escaping, I'd use electrobeams too. Obvious choice, really. You are a goat who has been imprisoned for the crime of witchcraft. 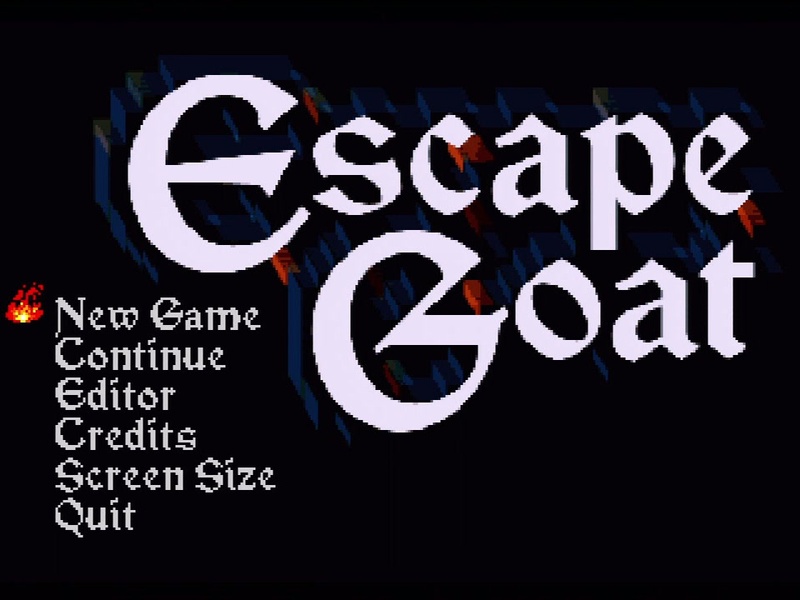 With a premise like that, and a name like Escape Goat, I would have expected a zany, pun-filled adventure, but actually, if you ignore the fact that you are a purple goat being aided by a yellow and red mouse to escape from a prison filled with sheep and grim reapers, it takes itself very seriously. There are elements of lore, talking about how the grim reapers were formed, what would happen if you were to escape, and other things of that nature. Pretty good. Putting together a score for this one is tricky. The gameplay is extremely solid, with fun and effective mechanics. Sure, the graphics could be better, but I don’t really see how improved graphics would have made the game any better. The only complaint is a relatively short length. With any luck, the level creator will lead to the development of a few hundred new levels. I certainly wouldn’t mind. 9.0 / 10: A short, slick puzzle platformer with solid fundamentals and loads of potential. I know that if I was trying to keep a goat from escaping, I’d use electrobeams too. Obvious choice, really.